2.5 Amp CNC Router / CNC Mill Stepper controller. Routout 4 Axis Plug and Play CNC Controller. The Routout CNC 4 Axis stepper motor drive box has many uses including for CNC retrofitting / robot control or driving you own CNC machine. It is very simple to wire simple connect up the motor connections and power supply, plug into your PC via the Printer Port and run your chosen CAD / Cam software. The Routout 4 Axis Plug and play driver is supplied with the Routout CNC software but is compatible with all of the popular CNC Printer port driven software, including but not limited to Routout CNC, Mach, Turbo CNC, KCam etc the list go on. All built controllers are supplied with Linux CNC software. For more information on the software. Please visit the software page from our products page. 2.5 A Output Drive Capabilities. Use 12 - 24 Volts Power Supply. Small Case Size foot print only 120mm x 75mm X 55mm. Internal 5V logic driver onboard (no need for 5v Supply). The Resolution can be change from the default setting via the internal jumpers (please see the below table). Simply plug and Play Very little wiring just connect motors and power supply. Supplied with Routout CNC software. Supplied with all Power Supply & connectors. 3/4 Axis Plug and play controller PDF. All software will be supplied on CD. Note CNC controllers are now supplied black not blue. If you would like any further information please do not hesitate to contact me. 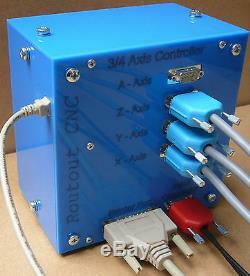 The item "4 Axis 2.5 Amp CNC Router / CNC Mill Stepper controller" is in sale since Thursday, June 5, 2014. This item is in the category "Business, Office & Industrial\Automation, Motors & Drives\Electric Motors\General Purpose Motors".gaylor" and is located in Melton Mowbray. This item can be shipped worldwide.